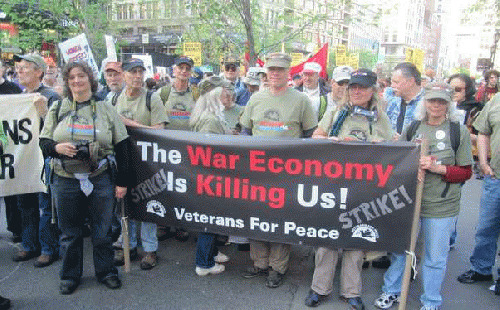 This Memorial Day Let's Start Caring for Our Nation's Veterans: No More Ducking the Real Cost of US Wars! Whether he ever said it or not, I'm going to borrow from a quote often attributed to Abraham Lincoln and alter it a bit to say: "American politicians must love war veterans -- they keep making so many more of them." The truth though, is that American politicians, and in fact the American public as a whole, don't really give a damn about veterans. Sure, they politicians will go to the parades and wear their American Legion and Veterans of Foreign Wars hats (some even if they never really served in uniform or went to war), and sure ordinary Americans will applaud in the airport as a bunch of men and women in uniform walk by, but that's about it. When it comes to adequately finding health services and pensions for vets after they've put in their time, or paid a price in terms of lost limbs, disease or mental trauma, the government is always ducking responsibility and the public is whining for lower taxes, not calling for more money for veterans' benefits. My mom, a WWII Navy veteran who in 1944 selflessly answered the call for women to sign up so that more men would be freed up for combat duty, currently suffers from Alzheimer's and other health problems. She has a modest pension from my late father's job, and from his Social Security, but that's all eaten up by the cost of her live-in companion and other health care assistance that is not covered by Medicare. We helped her apply for a veteran's pension that could provide another up to $17,000, but were told it could take up to a year from the time of filing the rather simple paperwork before she'll see a dollar. From what I hear many vets simply die while waiting for the processing of a pension to which they are clearly entitled.